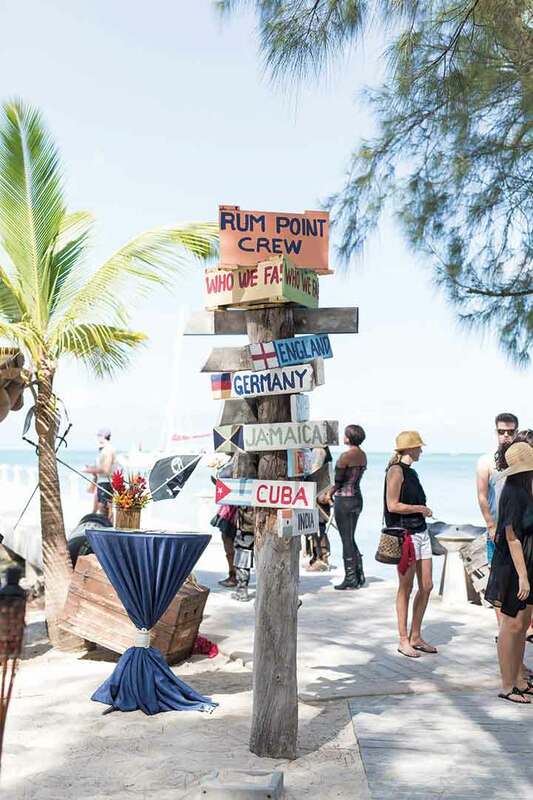 Headlined by celebrity chefs and wine experts, Grand Cayman’s annual food fest is all about barefoot indulgence. When I arrived in the Cayman Islands in January, I had one thing in mind: food. The tiny British territory—three dollops of land just south of Cuba and west of Jamaica—may be best known to the outside world as a haven for offshore wealth, but to food lovers, it is the culinary capital of the Caribbean. Grand Cayman—the largest island, measuring all of 197 square kilometers—has more than 250 restaurants, many of them splendid spaces. Of course, food and money aren’t entirely separate things. It’s hard to make one without the other, and Caymanians, whose living standards are on par with Switzerland, can afford to import premium raw ingredients and hire the talent to transform them. Avecita’s chef Massimo De Francesca. Photo by Kimpton Seafire Resort & Spa. My weekend visit coincided with the ninth annual Cayman Cookout, a swanky four-day food festival that brings together world-famous chefs, sommeliers, and pleasant beachside settings. Centered largely around the Ritz-Carlton on Seven Mile Beach, it offered a slew of tastings, presentations, and dinners, ranging from star-powered cooking demos to an extravagant private jet trip to Cayman Brac for a wine-paired lunch hosted by chef Eric Ripert of New York’s acclaimed Le Bernardin restaurant and Guam-born millionaire Terry Peabody, owner of New Zealand’s Craggy Range winery. 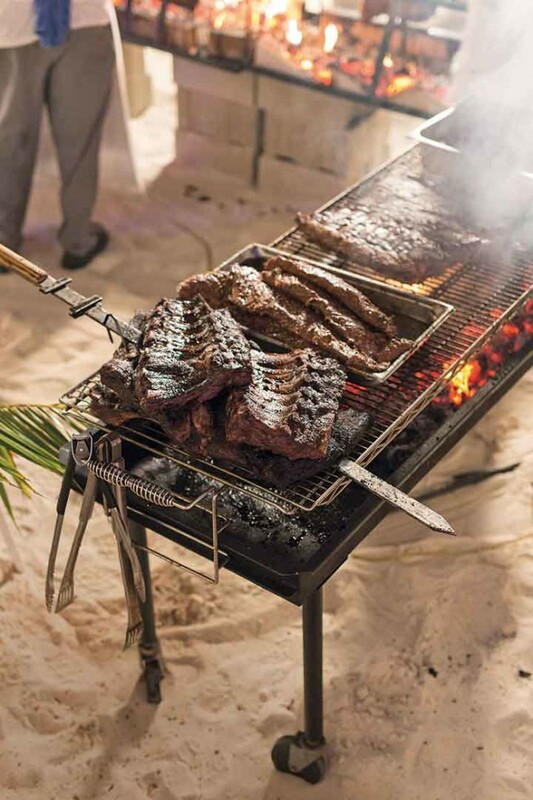 A “barefoot barbecue” at Royal Palms Beach Club. Photo by Artisanal Aperture. My first event was a Friday evening barbecue held on a slash of sand at the Royal Palms Beach Club, where barefooted enthusiasts moved between food stalls manned by some of the planet’s greatest chefs, among them Ripert, Anthony Bourdain, and José Andrés. A fresh sea breeze fanned grill flames as kitchen teams sliced, diced, and plated. Here, a brisket-and-tongue banh mi sandwich; there, a surf and turf of scallop with strips of Ibérico ham, or a kielbasa with American cheese, bacon jam, and chicharrón. The casuarina-shaded beach at Rum Point is another popular Cayman Cookout Venue. Photo by Artisanal Aperture. The celebrities exuded as much panache as the food. Bourdain, pinching a bottle of beer between his thumb and index finger, acceded to requests for photos but seemed not quite prepared to go so far as to pretend to like it. Andrés visited a colleague’s massive grill where great hunks of beef blackened above raging flames. It was how a pack of maniacs would cook, roasting whole dismembered parts rather than cuts of beef, and yet his crew sliced it into bite-size pieces that were uniformly perfect and exquisitely tender and delicious. And Andrés was loving it. Heavy swords, the kind of weapon pirates who once raided the island would have carried, were stuck in the sand, and Andrés pulled them out with the look of a good-humored lunatic, held one up, and handed the other to a woman who requested a picture together. Ripert is partly why Cayman is the Caribbean’s culinary center. The island had a fairly robust food scene going back even to the 1960s, the same period its financial services industry took off. But in 2005, Ripert opened Blue by Eric Ripert at the Ritz-Carlton, Grand Cayman, raising the bar on contemporary haute cuisine. And in 2008 he hosted the inaugural Cayman Cookout, roping in his friends Bourdain and Andrés and rotating in other A-list chefs. 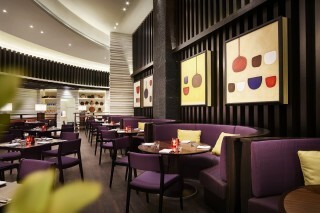 Now, the island has many more fine restaurants than one could reasonably visit even on a long stay. And I was there for just a short one. 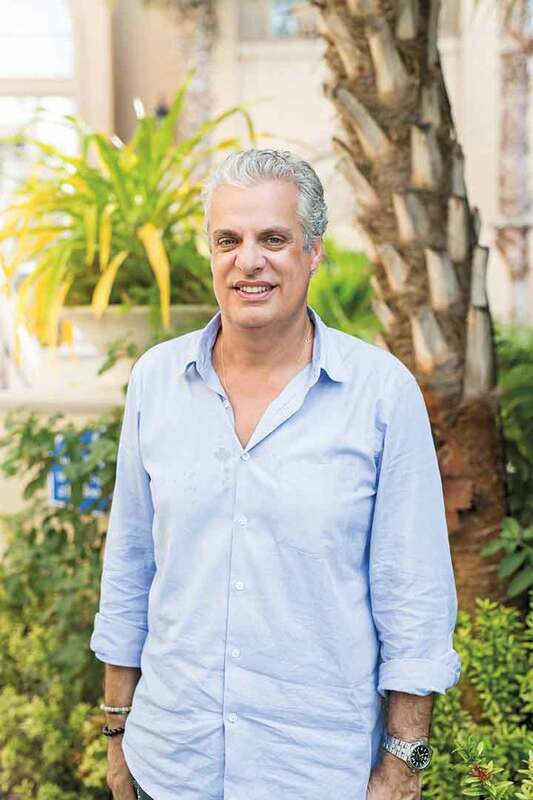 New York-based Eric Ripert helped kick-start the Cayman Cookout back in 2008 when he roped in fellow celeb chefs Anthony Bourdain and José Andrés to co-host the event. Photo by Artisanal Aperture. The key to these things is, of course, to pace yourself, in food as in drink, and not to fill up too quickly nor so completely that you wake in the middle of the night asking yourself what you have done. The organizers should run a public service announcement: Eat Responsibly. But then again, who ever does that? Fish tacos at one of the festival’s beachside soirées. Photo by Artisanal Aperture. I passed fish fry stalls and barbecue stands before pulling into Over the Edge, a funky bar and a café with fine views over Old Man Bay. Here I contemplated goat curry and jerk chicken before settling on the conch steak, a hearty mollusk whose former residence, a marvelous shell large enough to hold in two hands, I’d seen for sale at a roadside vendor. The meat came pounded, breaded, and fried—a Caribbean schnitzel!—and managed to be both typical and exotic, in that everything breaded and fried tastes similar. Still, it was a large conch. I ate nothing more in preparation for my weekend’s main event: a pairing dinner at Avecita, the signature restaurant at the Kimpton Seafire Resort & Spa, which opened just two months earlier on Seven Mile Beach. The dinner was a kind of joint debut. On the one hand, it marked the global launch of Lingua Franca wines, a new label from Burgundian winemaker Dominique Lafon and Oregon-based master sommelier Larry Stone. 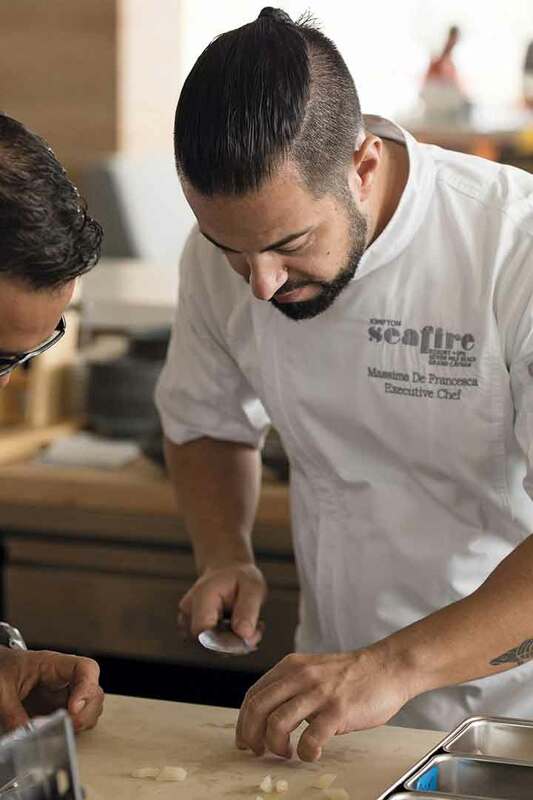 On the other, it announced Avecita—whose focus is progressive, contemporary Spanish cuisine—as a heavyweight contender in the Caymans. 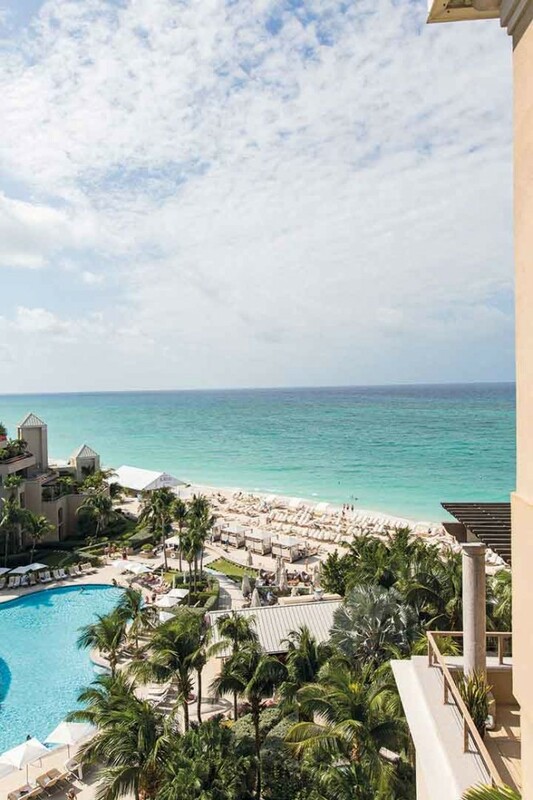 The Ritz-Carlton, Grand Cayman is home to one of the island’s best restaurants–Blue by Eric Ripert–and the venue for many of the Cayman Cookout’s events. Photo by Artisanal Aperture. Chefs Massimo De Francesca and Remy Lefebvre had set up the previous evening’s only all-vegetarian stall, highlighting locally grown bounty in spectacular tapas-inspired bites—charred baby eggplant with burnt eggplant-sago sauce, whole grilled baby zucchini with smoked romesco, roasted butternut squash with pumpkin-seed pesto. But we were far from the beach now, sitting under Avecita’s high ceilings with a view of a wood-fired oven and gleaming exhibition kitchen. I could hardly wait to see what they’d bring to the table tonight. Following a trio of amuses-bouche (a cube of lamb tartare, slow-cooked quail egg, smoked salmon with tarragon vinaigrette on a saffron cracker), the first course came in the form of Spanish cod. Salted and reconstituted in water, lightly blanched and poached in almond milk, the fish was served on a chilled black plate with an anchovy-flavored red-bell pepper infusion and a sprinkling of dehydrated olives and salt flakes. Next came a hen-and-truffle cannelloni with Manchego cheese on a delectable and delicate broth of smoked, roasted lobster. The layering of pure and clear flavors, which were discernible and yet worked together like instruments in an orchestra, was marvelous. And yet, the featured dish, the pièce de résis-tance—it seems mandatory to introduce the moment in menu French—was still to come: a tender, tiny squab cooked sous-vide then quickly grilled on the plancha to crisp up the skin. 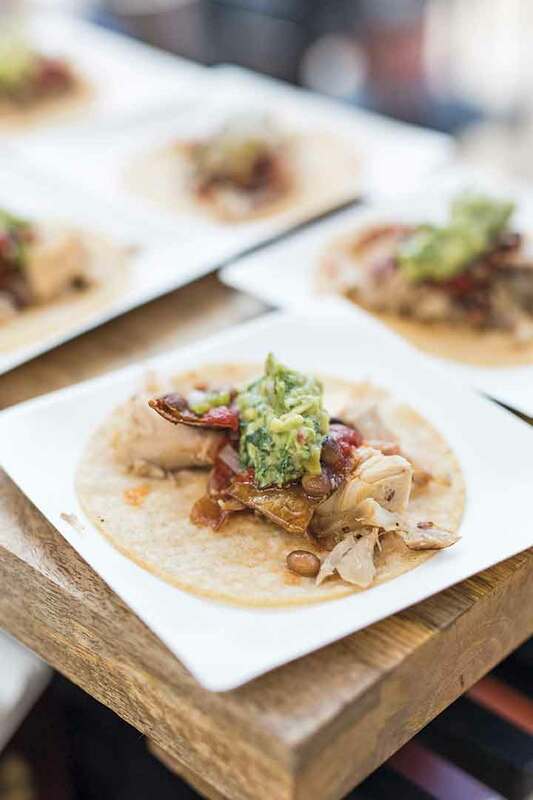 It was served over a spicy-sweet Mexican mole that teamed cocoa with a veal stock–based demi-glace and roasted chilies. The only problem with the bird was that there weren’t two or three, or maybe even six or eight. Even though dessert was yet to come, my single squab left me feeling teased, even a little mournful. Either from lack of courage or enough good taste, I did not carry my plate to the kitchen and beg for more. Instead, I consoled myself with the remains of a bold and lovely pinot noir, and considered whether I’d just have to come back again next year. Miami is the gateway for most Cayman-bound passengers, though nonstop flights also connect the islands to New York, Toronto, and other Caribbean destinations. The next edition of the Cayman Cookout takes place January 11–14, 2018, and will mark the festival’s 10th anniversary. Seven Mile Beach; 1-345/943-9000; doubles from US$380. Seven Mile Beach; 1-345/746-0000; doubles from US$400. 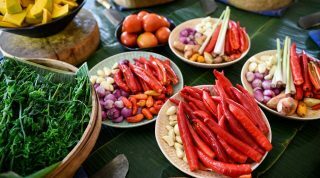 This article originally appeared in the June/July 2017 print issue of DestinAsian magazine (“Caribbean Cravings”).